Named for a miniature cave, this bamboo "grotto" keeps cheese in its prime. Grotto, n. A little cave, especially a cute, comfortable one. Artisan cheeses are often ripened in cool, humid rooms called caves, so it's no wonder dairy fiend Jessica Sennett dubbed the bamboo crate she created to house her favorite snack a grotto. 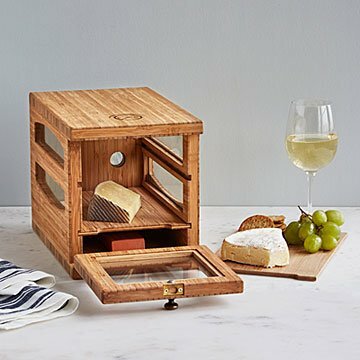 Designed to keep special cheese tasting its freshest, Jessica's creation sports two removable shelves, plus a clay brick that helps control humidity. Adjustable vents at the grotto's rear panel allow for airflow when cheese demands it, too. For long-term storage, keep your keeper in the fridge—or, if you're planning on chowing down quickly, place it on the countertop for all to see. (Be honest: How long can you really stay away from good cheese?) Handmade in Durham, New York. When you think “cheese freak,” think Jessica Sennett. A true devotee of the planet’s most luscious molds, Jessica’s apprenticed in France (wow!) and Washington (OK, maybe less wow, but still cool). She’s also a veteran of some real impressive cheese shops, like California’s Cowgirl Creamery. Finally—and perhaps unsurprisingly—she makes her own cheese, which we bet tastes great straight from her grotto. So when can we try a slice? Hand wash shelves with extremely hot water and a splash of distilled white vinegar. For long-term storage of cheese, it is recommended to keep the cheese grotto at refrigeration temperatures (34ºF to 39º F, preferably 39ºF).